There are those who are drawn to the unusual or strange —to distant, exotic places—, or to stimuli which wounds or shocks, be it provocation and scandal, music which is violent and boisterous, works which impress by size alone, “strong emotions” or high-risk sports. This boy, who pulls aside a curtain and finds a landscape, seems to be telling us that we need not always look afar for the marvellous, as it is quite near: nature itself offers us continual motives for astonishment, which rises up in the human being who is witnesses to the spectacle of its beauty. “There are two ways to live your life: one is to believe that miracles do not exist; the other is to believe that everything is a miracle. He to whom emotion is unknown, who no longer wonders nor is filled with ecstatic reverence, is as good as dead” (Albert Einstein). 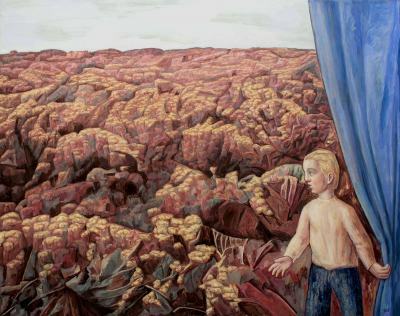 In this painting, the first of the series The Show Begins or The Spectacle of Nature, there is a certain ambiguity in the treatment of the landscape, comprising forms that might be understood as geometrizations of plants and minerals. This is a generalization that includes living and non-living things, as all form part of the great spectacle of nature.